It's about that time of year when everyone is setting goals for the New Year. Most people set fitness goals, so if you are someone who is just getting into fitness, I'm going to share a bit of advice that I wish someone gave me 8 years. Not only will it serve as motivation to stick with it, but also once you reach your goals, you will want to compare it to an After Photo to see how far you've come. This is something that I wish I did. When I first started training with Dave in January 2004, he took my measurements at the gym. I hated it, but he insisted on it, and once I started seeing progress, I would always ask him to send me a copy so I could visually see my progress. The things that we measured were: weight, % of body fat, fat mass, lean mass, neck, chest, biceps, waist, hips, upper thighs, and calves. In the beginning we revisited these measurements every 3 months or so, then eventually every 6 months. We don't take these measurements anymore, being that my fitness goals have changed, but I do like to do this at the start of every year. This is an online social community primarily for those who run, bike and swim. It has a very strong community feel with people offering support, encouragement and motivation. I like to use it to read about the workouts that others, especially real-life-friends are doing. I started using this with a group of colleagues because we had a contest to see who could run 500 miles in a year. Since it started, almost everyone in the group has either quit the company or stopped running. There are only 2 of us left to use it and all we do is post mileage. There are no details about the run, no social aspect -- it's about seeing how many miles we are logging. Daily Mile rounds off numbers, so if you are looking for exact mileage, this is a good one to use. I also like how it projects what your totals will be. 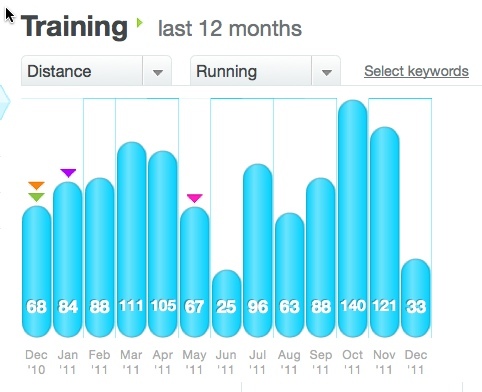 My running coach uses this platform to post our training plans, so I upload my Garmin and other workout data for him to see. To be honest, I haven't used nor explored any of the reporting features here. As for calorie tracking, I've used Calorie King, Daily Burn, and My Fitness Pal and now I just use the FitBit. Calorie King and Daily Burn offers free vs. paid services. As you would expect, all the useful stuff is in the pay option. I found Calorie King to have a very, very good food database. At the time that I used Daily Burn, it was still relatively new and it's food database wasn't as complete. I had to keep entering the nutritional values of the foods I ate, which was too much work for me. My Fitness Pal is free, offering the same functionality as the other two's paid options. The interface was the user-friendliest of all 3 and the food database was more than sufficient. It also offers a free mobile app. And now, as of this week, I started using the FitBit, which interestingly enough, is about to introduce a partnership with My Fitness Pal. I'm intrigued to see how that is going to work. It has a row for each day of the month, as well as one last column on the end for "Comments" where I write anything else I want to notate about that day. I like using Excel because I can sort and filter the data to see correlations, which is the whole point of why you should keep a Training Journal to begin with. And tonight, I experienced exactly why this is important. As I've mentioned, over the past week my R foot has started hurting again. I say again because it is the same foot that I injured back in June that sidelined me for a month. Though it doesn't hurt as bad now as it did then, the type of pain is the same. As I've also mentioned, I've been doing lots of strength training that includes running lots of stairs and doing hill repeats. I've noticed that my calves, especially the R one has gotten REALLY tight. I have tried to roll it out and use the stick, but I can barely make a dent in it and it’s almost sore to the touch. During this evening’s massage appointment, my therapist told me that my R calf had 2 knots the size of golf balls (one on each side). As he worked through the knots; i.e. tortured me, he asked if I was having any foot issues. I said, "YES" and asked him if the foot issue and tight calf could be related. He said they absolutely were and then pointed out where different tendons and muscles (stuff way more scientific than I know about) would affect each other. As he went on about this, I had a flashback to this past May. I had gotten a post-marathon massage where the therapist told me I had "something going on" in my R calf that needed to pay attention to it. Well I didn’t and shortly thereafter I sustained the aforementioned foot injury. Although I faithfully logged all my workouts, admittedly they were mostly for selfish reasons so that I could see numbers on pretty charts. I haphazardly notated the details that Garmin doesn't track. Had I done so, I might have made the calf/foot correlation on my own. This is one of my goals for the New Year, to be thorough with recording the details of my workouts. Not only is it useful to go back and review your progress, but it also becomes reference material on yourself.